The small town of Portofino – located on the Ligurian coast – offers a stunningly beautiful scenery: crystal-clear water, a wonderful harbor lined with exclusive boutiques, fine restaurants and colorful houses, and steep green hills that rise behind them. Chiesa di San Giorgio and Castello Brown, which can be reached after a few minutes’ walk, are the perfect place to enjoy this unique and breathtaking landscape as well as Potofino’s beautiful surroundings. The castello from the 15th century provides a nice garden and a matchless view of Portofino and its harbor. If you continue your way a little bit uphill through lovely pine forests, you will arrive at Portofino’s lighthouse wherefrom you have a great view to the coast and the open sea as well. Thanks to its unique beauty, Portofino is not only popular with celebrities but also with couples for destination weddings from all over the world. 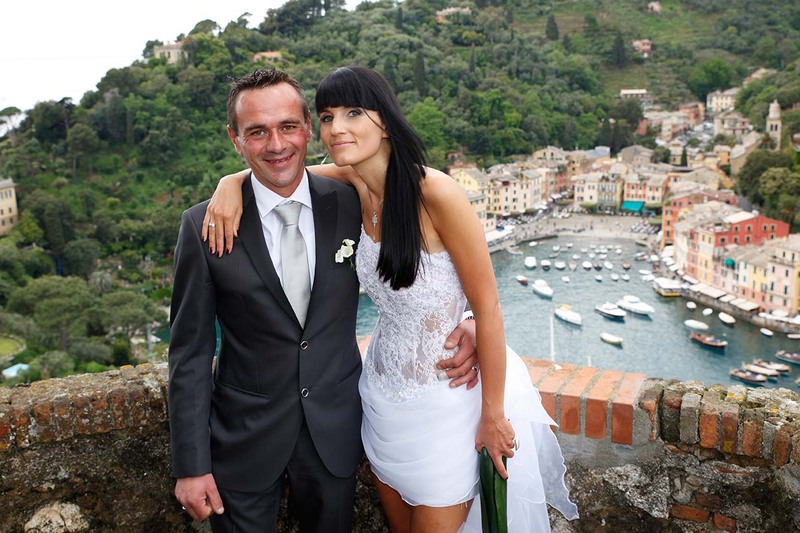 Also Elisa and Werner decided to get married in Portofino. Their civil wedding ceremony was followed by an aperitif and a dinner in an elegant restaurant. The marriage was rounded off by a nice boat trip along the picturesque coast of Portofino. Portofino is mostly suited for small weddings with up to 15 to 20 guests. Apart from civil or symbolic weddings, also protestant or catholic ceremonies are possible. Private villas, noble restaurants or also for instance a luxurious yacht offer the perfect location for a wedding reception. Additionally, the wedding day can be combined with lovely trips which offer the opportunity to explore the nice Tigullio Gulf with its picturesque bays and stunning beaches.